Adonis is a complicated god who touched many cultures. Although he's often portrayed as Greek, his origins are in early Assyrian religion. Adonis was a god of the dying summer vegetation. In many stories, he dies and is later reborn, much like Attis and Tammuz. This lover of Cybele went mad and castrated himself, but still managed to get turned into a pine tree at the moment of his death. In some stories, Attis was in love with a Naiad, and jealous Cybele killed a tree (and subsequently the Naiad who dwelled within it), causing Attis to castrate himself in despair. Regardless, his stories often deal with the theme of rebirth and regeneration. Ever wonder why crunched-up grain is called cereal? It's named for Ceres, the Roman goddess of the harvest and grain. Not only that, she was the one who taught lowly mankind how to preserve and prepare corn and grain once it was ready for threshing. In many areas, she was a mother-type goddess who was responsible for agricultural fertility. Worshipped by an early Semitic tribe called the Amorites, Dagon was a god of fertility and agriculture. He's also mentioned as a father-deity type in early Sumerian texts and sometimes appears as a fish god. Dagon is credited with giving the Amorites the knowledge to build the plough. The Greek equivalent of Ceres, Demeter is often linked to the changing of the seasons. She is often connected to the image of the Dark Mother in late fall and early winter. When her daughter Persephone was abducted by Hades, Demeter's grief caused the earth to die for six months, until Persephone's return. Lugh was known as a god of both skill and the distribution of talent. He is sometimes associated with midsummer because of his role as a harvest god, and during the summer solstice the crops are flourishing, waiting to be plucked from the ground at Lughnasadh. Fleet of foot, Mercury was a messenger of the gods. In particular, he was a god of commerce and is associated with the grain trade. In late summer and early fall, he ran from place to place to let everyone know it was time to bring in the harvest. In Gaul, he was considered a god not only of agricultural abundance but also of commercial success. Osiris taught men to break up the land which had been under flood) to sow the seed, and, in due season, to reap the harvest. He instructed them also how to grind corn and knead flour and meal so that they might have food in plenty. By the wise ruler was the vine trained upon poles, and he cultivated fruit trees and caused the fruit to be gathered. A father was he unto his people, and he taught them to worship the gods, to erect temples, and to live holy lives. The hand of man was no longer lifted against his brother. There was prosperity in the land of Egypt in the days of Osiris the Good. Parvati was a consort of the god Shiva, and although she does not appear in Vedic literature, she is celebrated today as a goddess of the harvest and protector of women in the annual Gauri Festival. This apple goddess is the keeper of orchards and fruit trees. 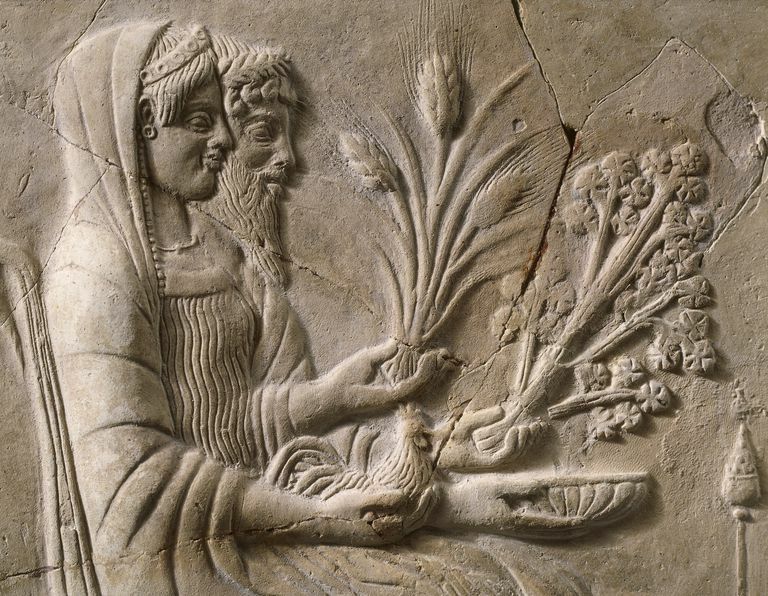 Unlike many other agricultural deities, Pomona is not associated with the harvest itself, but with the flourishing of fruit trees. She is usually portrayed bearing a cornucopia or a tray of blossoming fruit. Despite her being a rather obscure deity, Pomona's likeness appears many times in classical art, including paintings by Rubens and Rembrandt, and a number of sculptures. Tammuz of the Sumerian hymns... is the Adonis-like god who lived on earth for a part of the year as the shepherd and agriculturist so dearly beloved by the goddess Ishtar. Then he died so that he might depart to the realm of Eresh-ki-gal (Persephone), queen of Hades.